Tech Soup provides a literal Technical Knock-Out (TKO) for high-tech headaches plaguing nonprofit groups; courtesy of a one two punch from the information and products offered at TechSoup. TechSoup operates as a national web-based resource, providing invaluable computer and software information to nonprofit organizations on a daily basis. TechSoup also offers a product philanthropy service called DiscounTech that makes donated and discounted technology products available to nonprofit organizations with 501c3 status. Debuting on May 9, 2000, TechSoup was an immediate heavyweight champ in the nonprofit sector, placing computer complications on the ropes for charitable groups of all sizes and weight classes. On any given day, TechSoup’s website serves up 380 how-to articles distributed between 16 technological categories. In addition, nonprofits can find 67 downloadable worksheets. All information is formulated by technology experts and nonprofit staff. (See our sidebar for a selection of current titles). Fifteen discussion forums are used by more than 3,000 members of the nonprofit community. Some messages refer to technological problems many readers encounter; others offer solutions to these specific issues and provide general applications information. Being surrounded by a formidable group of like-minded charitable workers provides moral support as well as technical assistance. The TechSoup message boards can also serve as a powerful networking venue for groups and individuals. In this age of increasing reliance on information technology, TechSoup is a particularly popular disseminator of cutting-edge computer expertise. TechSoup’s E-newsletter, “By the Cup,” is read by 34,000 subscribers each week. Website registration and E-newsletter sign-up take mere minutes, yet reap ongoing rewards. If you want to find out about IT information or resources for charities, then this is the place to go on the web. A technology site dedicated to the non-profit sector and with a fantastic amount of the most useful and important information. Updated since last year, it still contains the essential guides, articles and information on technology planning, hardware, software, using the internet, networks, databases and much more. And it now has a series of discussion (message) boards covering the same topics, where you can ask questions and get answers from IT experts and other charity users. And all built for the non-profit sector. Excellent. The United Cerebral Palsy & Handicapped Persons Association named TechSoup their Nonprofit Site of the Month both for September 2000 and April 2002. Their reasoning: Because it’s a great technology site for nonprofits. I really appreciate all the resources that TechSoup makes available. It is definitely most helpful to those of us in the nonprofit community trying to wear many hats and find info ASAP. Again, many thanks! 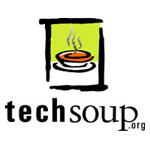 Tech Soup provides 501c3 organizations with donated and discounted technology products. Uppercuts to under-funding, left hooks to outdated software and right jabs to archaic computer equipment have been accomplished through impressive corporate partnerships. Regular notification of “New Products” offered through DiscounTech is provided by free subscription and read by 22,000 subscribers. Since the service launched in 2002, almost 20,000 organizations have received more than 576,000 products through this service. This translates to more than $160 million in nonprofit funds freed-up for alternative uses within the charitable sector. You are providing a terrific service to the nonprofit industry especially the small nonprofits who struggle and have a difficult time making ends meet with their programming much less with technology upgrades. Thanks to you, my organization now has Office 2000 and we have greatly improved our capacity. Buckets of thanks for a great service to the nonprofit community!!! I recently received the shipment of products I ordered and I can not begin to thank you enough. We received well over $10,000 worth of product for a little under $1,000. And the shipment arrived in less than 2 weeks from order date! We are a small, but growing (thanks to you) non-profit specializing in mental health services. We just celebrated our 50th Year serving the Merrimack Valley here in Massachusetts. Over the years many agencies have had to close their doors, but we have managed not only to survive but to grow at a slow and steady pace. With over 90% of our budget directly funding services, little is left for technology. Thanks to the DiscounTech program we now have a network of 15 computers at our main office with a VPN connecting a satellite office with 5 computers. Our goal is to eventually equip every clinician, every offsite program, and every staffer out in the community with PC's and the ability to communicate with central office anytime and anyplace. Thank you again DiscounTech! Thank you from all the staff and the people we serve. TechSoup and its DiscounTech service are projects of San Francisco Bay Area’s CompuMentor. CompuMentor provides hands-on consulting services to nonprofit Bay Area clients and oversees the nationwide efforts of TechSoup and DiscounTech. Their astounding success is due, in part, to continuing support from many organizations and corporations, including Surnda Foundation, AOL Time Warner Foundation, W.K. Kellogg Foundation, the Charles Stewart Mott Foundation, and Carnegie Corporation of New York and The Morino Institute.